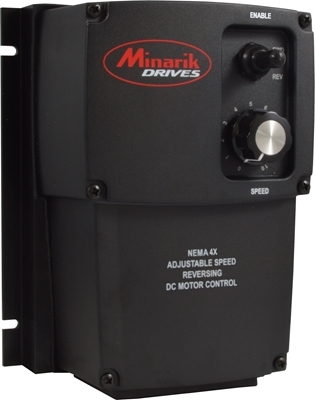 The next generation of PWM controls from Minarik Drives has arrived! Using a 115 or 230 VAC power source, the MDPM Series is designed to run brushed DC motors, up to 180 VDC. The PWM technology creates a cleaner output voltage compared to older SCR circuitry, which allows the motor to run at a cooler operating temperature at comparatively higher and lower speeds. The MDPM is also a regenerative control, meaning it can reverse on-the-fly without any contacts on the motor armature. The integrated dump circuitry eliminates the need for accessory cards and external relays in high inertia applications. The onboard microprocessor allows for custom programming for OEMs. Whether it’s as simple as changing the purpose of a jumper, input, or trim pot, to programming entire routines and behaviors specific only to the OEMs application, the MDPM is great for integrating PLC like functionality into your operation. Doing this can eliminate the need of a separate PLC altogether or enhance a system that currently does not have one. The MDPM Series has been tested to the 61800-5-1 Standard and is UL listed in the US and Canada, and includes isolation for remote control from an analog signal. 4Q Reversing: Regenerative (4-Quadrant drives have the ability to perform quick and contactorless reversing on-the-fly.